The Children and Community Services Act 2004 (Act no.2004/034) is the principal legislation governing the care and protection of children in Western Australia. It is administered by the government department responsible for the welfare of children. In 2014, this was the Department for Child Protection and Family Support. The purpose outlined in the Act is broad. It seeks to promote the wellbeing of children, other individuals, families and communities and to acknowledge the primary role of parents, families and communities in safeguarding and promoting the wellbeing of children. The Act aims to encourage and support parents, families and communities in carrying out that role. It provides for the protection and care of children in circumstances where their parents have not given, or are unlikely or unable to give, that protection and care. The Children and Community Services Act 2004 repealed the Child Welfare Act 1947, and the Community Services Act 1972. The purpose of the Children and Community Services Act 2004 is to promote the wellbeing of children, other individuals, families and communities and to acknowledge the primary role of parents, families and communities in safeguarding and promoting the wellbeing of children. The Act aims to encourage and support parents, families and communities in carrying out that role. It provides for the protection and care of children in circumstances where their parents have not given, or are unlikely or unable to give, that protection and care. The Act also aims to protect children from exploitation in employment. 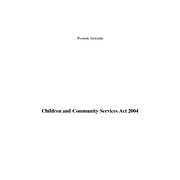 The Children and Community Services Act 2004 also repeals: the Child Welfare Act 1947; the Community Services Act 1972; the Welfare and Assistance Act 1961; to amend certain Acts and to provide for related matters. Supporting children and young people in the Chief Executive Officer's care. Protecting children and young people from abuse. Supporting individuals and families at risk or in crisis. Aboriginal and Torres Strait Islander Child Placement Principles are outlined in Division 3 of the Children and Community Services Act 2004. Divisions 2-3 of the Children and Community Services Act 2004 states the role of the Department in the placement of children in care in licensed facilities or with licensed people. The Department for Child Protection and Family Support administers the Children and Community Services Act 2004. The Department for Community Development administered the Children and Community Services Act 2004 after it took effect on 1 March 2006. Sources used to compile this entry: Law Research Service, Melbourne Law School, Law Library, The University of Melbourne. 'Find and Connect Project - Western Australia Legislation', 13 December 2013, held in the project files at the University of Melbourne eScholarship Research Centre.